I tried many solutions discussed in different forums, but none of them work for me. The folder is not compressed or encrypted. Check if you did compress the driver or folder in where you put the .mdf file. Properties -> Advanced and unticked the “Compress contents to save disk space” checkbox. After above things, you should be able to start the service again. Very simple to solve this problem. Find the SQL within name column and right click on that. You will get properties option, click on properties. 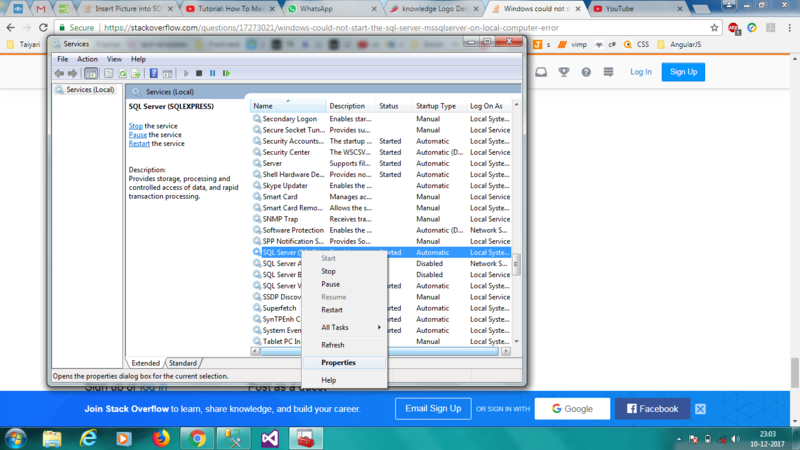 One new window will be open and there you have to click on Log On tab. And select the Local System Account. then apply and okay. After that come again in services.msc window. and right click on sql and click start. And finally, SQL Server services started successfully. enjoy and keep learning. I then followed the steps outlined at Rebuilding Master Database in SQL Server. Note: Take some good backups first. After erasing the master database, you will have to attach to all of your existing databases again by browsing to the .mdf files. Note that this will reset SQL server to its defaults, so you will have to hope that you can restore the master database from E:\backup\master.bak. I couldn't find this file, so attached the existing databases (by browsing to the existing .mdf files), and everything was back to normal. After fixing everything, I created a maintenance plan to back up everything, including the master database, on a weekly basis. In my particular case, this whole issue was caused by a Seagate hard drive getting bad sectors a couple of months after its 2-year warranty period expired. Most of the Seagate drives I have ever owned have ended up expiring either before or shortly after warranty - so I'm avoiding Seagate like the plague now!! I have had the same error recently. I have checked the folder Log of my Server instance. 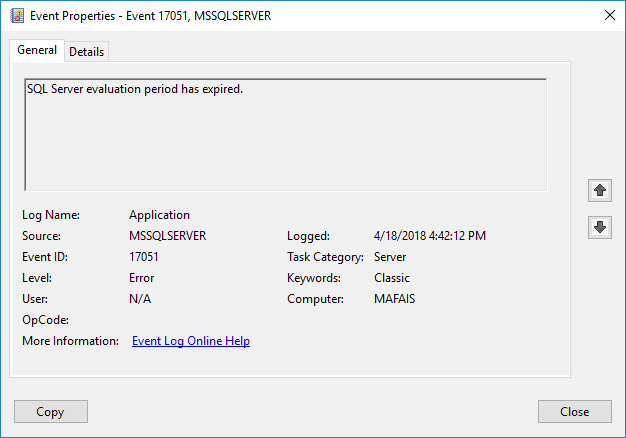 Error: 17204, Severity: 16, State: 1.
x:\Program Files\Microsoft SQL Server\MSSQL11.MSSQLSERVER\MSSQL\DATA\master.mdf for file number 1. OS error: 5(Access is denied.). Error: 5120, Severity: 16, State: 101. Unable to open the physical file "E:\Program Files\Microsoft SQL Server\MSSQL11.MSSQLSERVER\MSSQL\DATA\master.mdf". Operating system error 5:    "5(Access is denied.)". Error: 17204, Severity: 16, State: 1. FCB::Open failed: Could not open file E:\Program Files\Microsoft SQL Server\MSSQL11.MSSQLSERVER\MSSQL\DATA\mastlog.ldf for file number 2. OS  error: 5(Access is denied.). Error: 5120, Severity: 16, State: 101. 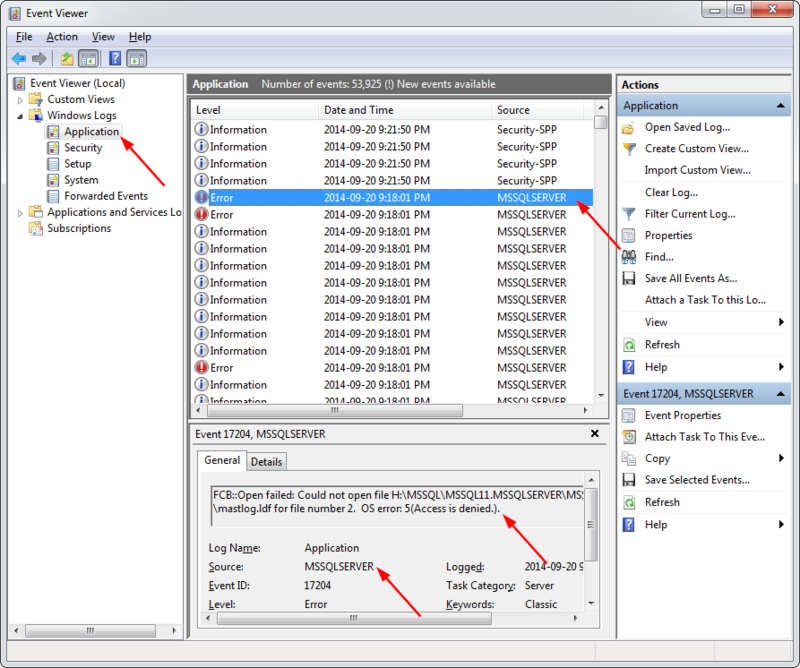 Unable to open the physical file "E:\Program Files\Microsoft SQL Server\MSSQL11.MSSQLSERVER\MSSQL\DATA\mastlog.ldf". Operating system error 5: "5(Access is denied.)". What is System Event Log saying? 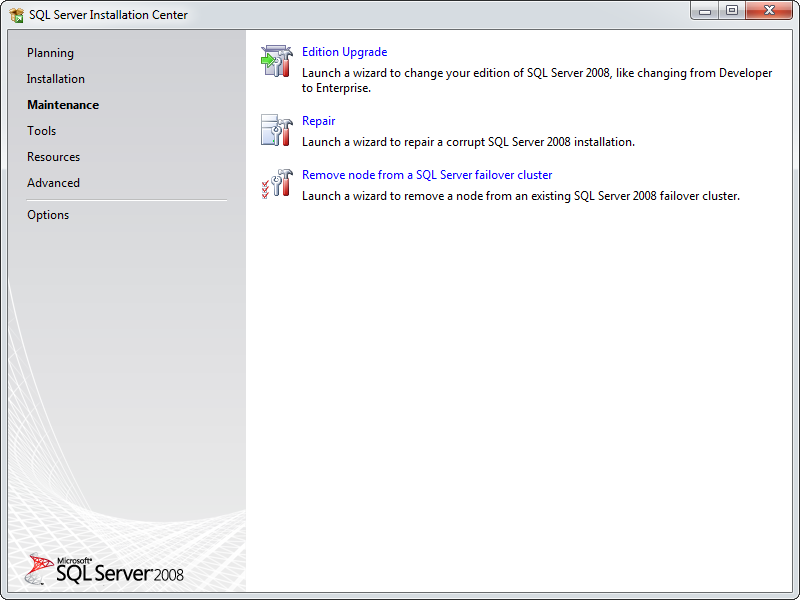 In My case I had to Upgrade the SQL Server since evaluation licence had been expired. I was getting this error today. And above answers didn't help me. I was getting this error when I try to start the SQL Server(SQLEXPRESS) service in Services(services.msc). When I checked the error log at the location C:\Program Files\Microsoft SQL Server\MSSQL13.SQLEXPRESS\MSSQL\Log, there was an entry related TCP/IP port. 2018-06-19 20:41:52.20 spid12s TDSSNIClient initialization failed with error 0x271d, status code 0xa. Reason: Unable to initialize the TCP/IP listener. An attempt was made to access a socket in a way forbidden by its access permissions. Recently I was running a MSSQLEXPRESS image in my docker container, which was using the same TCP/IP port, that caused this issue. 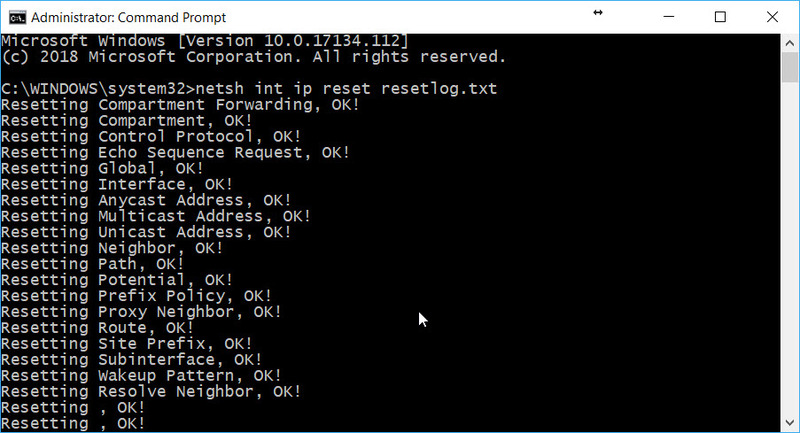 So, what I did is, I just reset my TCP/IP by doing the below command. Once the resetting is done, I had to restart the machine and when I try to start the SQLEXPRESS service again, it started successfully. Hope it helps. Make sure both drive have the same partition - ( like FAT or NTFS, preferably NTFS ) also make sure he NETWORK SERVICE account, has the access. Database rebuild fixed it for me as well. Also had to restore the old database from backup as it got corrupted during power outage... The copy master.mdf procedure did not work for me. try to start the SQL server services.. That's it. it will work..
Sql server error log file got corrupted. that is why it gives the problem even when you have all permissions.. when you delete it. new file will be generated. 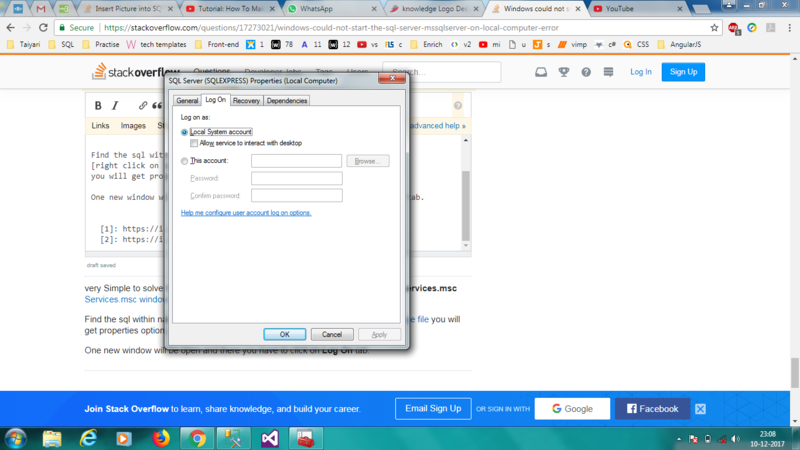 How to start SQL Server Agent?